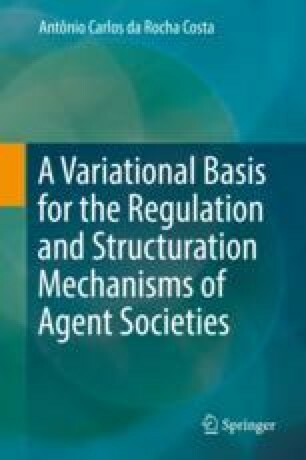 This book introduces a variational basis for the regulation and structuration mechanisms of agent societies. As will be made clear in the rest of this Introduction, and in the main body of the book, we mean by agent society a multiagent system with a full-fledged social organization, and by regulation and structuration mechanisms the social mechanisms responsible for every type of regulation and structuration process that may occur in such kind of multiagent system. The regulation mechanisms that we consider to operate in agent societies are of three types: structural, operatory, and functional. The structural regulation mechanisms are responsible for the maintenance and development of the structure of the set of social actors present in the society. The operatory regulation mechanisms are responsible for the maintenance and development of the networks of processes through which those social actors interact with each other. The functional regulation mechanisms are responsible for the maintenance and development of the set of social functions that the social actors perform for each other, on the bases of their networks of interaction processes. The structuration mechanisms are responsible for the construction of the various operatory levels of the society, on which those regulation mechanisms operate.